Streetstyle nail art tutorial | Memorable Days : Beauty Blog - Korean Beauty, European, American Product Reviews. Step 1: I'm going to use the sponge method again ^^. So put a little bit of green nail polish on your small sponge and dap the sponge on the tips of your nails. Do this to all your nails and let it dry. Step 2: Use a clean side of your sponge and put a little bit of pink nail polish on it. Dap the sponge with the pink side on the tips of your nails and let this dry. 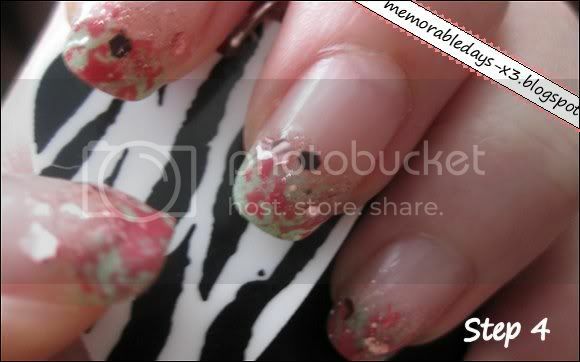 Step 3: Put some glittery nail polish on the tips of your nails and let it dry. Cute nails! I really like it! @Leenda,Mei, Becky & Donna ^^ thankyouuu!! I'm glad that y'll like it =D! 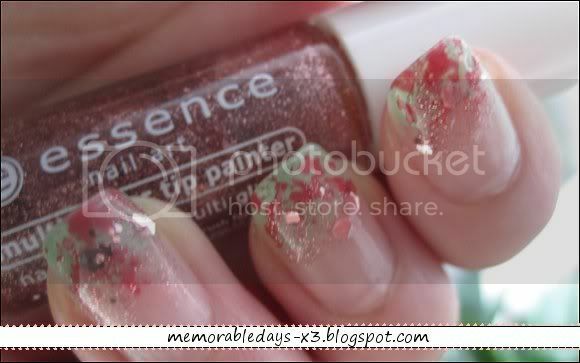 really cute nails, i love the contrast of red and green, reminds me of melons! the sponge technique is such a good idea!